Tomorrow is Sept 1st.... already! 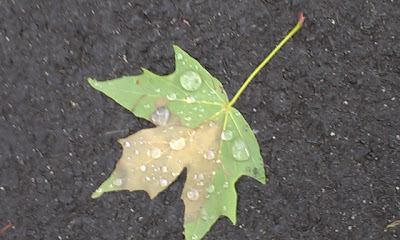 I'm looking forward to all the things I have planned this fall. Are you? While I was cleaning out my sewing room, which included my sewing basket, I came across a handwritten recipe for Cucumber Jelly. It was given to me last year while at our hand-quilting group at church. My notes were sketchy, and I can't quite remember which quilter gave it to me, but I have it narrowed down to 3 people. I think it was Doris K. My daughter buys cucumber jelly at craft fairs and loves it on crackers.. 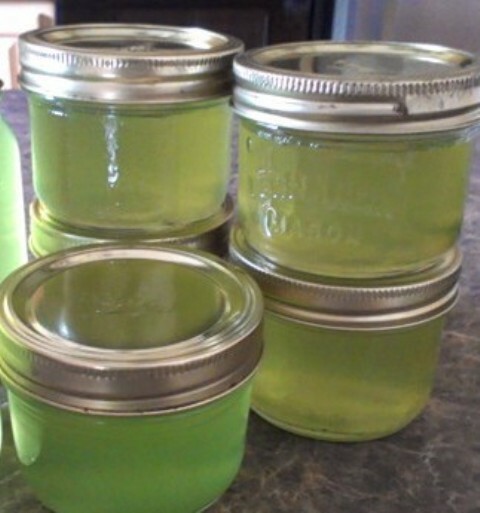 So with the help of my friend Linda H. who gave me a few of her big overgrown cukes, I made a batch of jelly today. I researched other recipes for cucumber jelly, and it's not very popular. Maybe it's a maritime dish? The recipes that I did find say to serve it with smoked salmon and cream cheese. So guess what I'm serving at my next get together. It is still setting as I write this, so I haven't tasted it, but it looks and smells so good. I'll share the recipe with you in case you have a few big cukes you want to use. 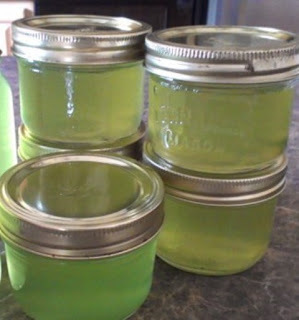 Cucumber Jelly - Yield 7 - 8oz jam jars. 3 - 4 big cukes, shredded and ground up with peel on. Strain through cheese cloth or sieve. Don't push too much, or the juice will be cloudy. Mix cucumber juice, sugar and vinegar in a big pot. Stir, and bring to a boil for 2 minutes. Then remove from heat and stir in the 2 pouches of Certo. Continue to boil for another half minute, and remove from heat again. Stir and skim off any foam for 4 or 5 minutes. The jelly will be a light green. If you want more color, add two or three drops of green food coloring. Bottle in jelly jars and let the jars set. Be sure to check the seals. If one doesn't seal, keep it in the fridge and use it first. Serve with crackers and cream cheese. I'm looking at my fall calendar of things to do, and I know I have to start getting back in my sewing room. It's been a mess, and just not nice to go into. I know if I spend 30 minutes just sorting and and putting things away, it would go a long way to getting back into the swing of things. It didn't take me long to clear off most of my sewing table. I have several partly finished projects. So I thought, let's just finish them rather than move them. Here's the first one finished. This little snowflake snowman didn't take very long to finish. I only had to machine quilt the border, then apply the binding. A total of 45 minutes. 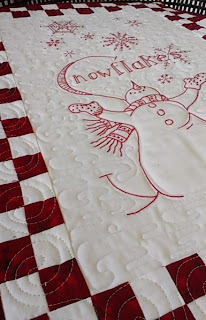 For a while I had a bit of a problem with the old question "Do you think it's ok to mix hand stitching, with machine quilting?" But I'm over it and I think it's just darling. 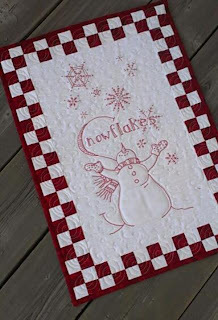 If you want to know the pattern, it's the "S" from Crab Apple Hill Designs, Snowmen, A to Zzzz. And the good thing is, I have something for show and tell at my September Quilt Guild Meetings. Ahh, I'm starting to feel good! View of the bathroom window. 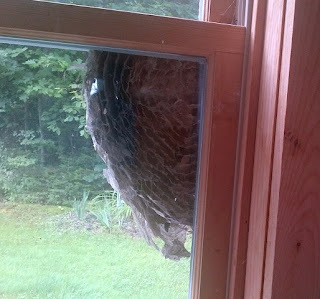 A few weeks ago, when we went to the cottage, we noticed that hornets had started building a nest on the outside of our bathroom window. A few weeks went by and it got quite large. 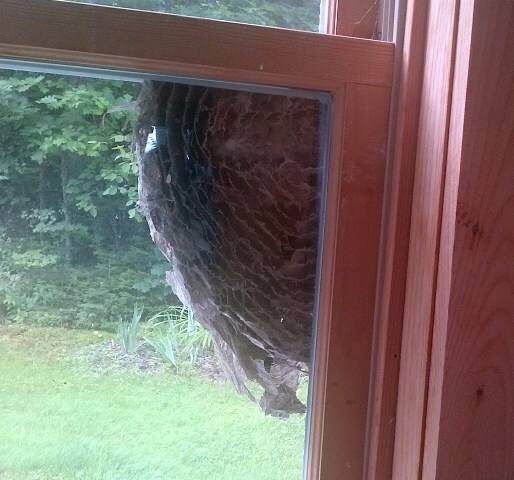 The good thing is that, the hornets kept to the back side of the cottage until just recently. It looks like a halloween ghost or something, doesn't it! Close up. Looks scary, doesn't it! When the hornets started coming to our side of the cottage, we decided we had better take action to remove them. We hung a trap, and within days, most of the hornets had been captured. 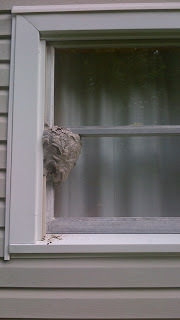 When the next was mostly vacated, we sprayed the nest, and in a few hours, there was no activity. It came off the bathroom window with an old egg lifter. It's gone now. 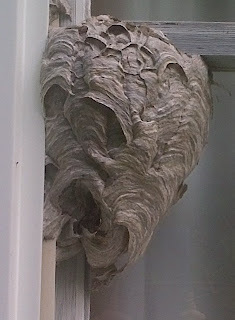 Just a few homeless hornets around, but I'm sure they'll find another home, or find their way into the trap. Very interesting to watch the hornets hard at work inside the nest. A wedding is a great time to take family pictures. Especially since the reception offered that everyone should wear hats of some sort. So, we all got dressed up and wearing the fascinators, that we made last week. It was just another reason to smile. We took some fun family pictures. All the girls wearing their fascinating finest! Donna and Gail. Do you like my Fascinator? Are we having fun yet girls! with the bow tie hanging. Boys will be Boys. Everyone loved the Lizard that Mitchell gave to Stephanie. Do you see this fabulous big spray of Flowers. Caitlin contributed it to the bouquet! Here are some fun pictures from Stephanie and Sean's reception party to celebrate their marriage. A kiss over the wedding cake.... eek, is that a Machete? They cut the cake with a fabulous Machete that Stef got when she was in Belize! The Maid of Honor, made the cake, and serves the Cake! And the Bride had a Mustache! Where's you get those ears Aurora? The Photo Booth was a hit. This past weekend, we attended the sweet wedding of my niece Stephanie to her long time beau, Sean. On their summer break from teaching English in Korea, they tied the knot! Congratulations! Mr. and Mrs. at St. Dunstan's Church. Don't you just love that blue crinoline! Relaxing walk to the park for pictures. Carry my shoes for me Sweetheart! her mother. Many special brooches. While my sister is here this week, she has been with me for my healthy walk each morning. All summer, I've been watching the planter boxes of a certain house, along the route. 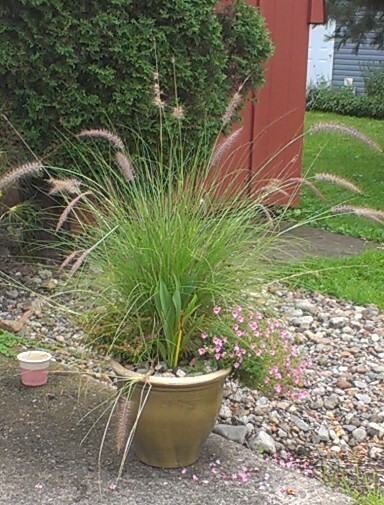 I love her gardens, and they are quite simple. But really well taken care of. I pointed them out to my sister this week. 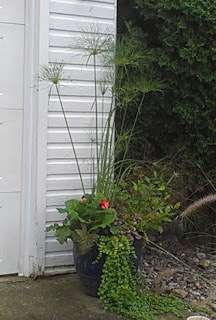 This morning, with coaching by my sister, and no cars in the yard, I was brave enough to go half way up this lady's driveway to take pictures of these two planters. I love them both. They are so different than the annual flowers that I had this year, which I loved up until two weeks ago. So my sister will research what plants are in them and help me plan my 4 planter boxes for next year. I've been picking blackberries this week. With my sister visiting this week, I thought I'd find a nice recipe to use up the berries. An Internet search turned up this slump recipe. I liked it alot. I tried it It's a not so sweet but very flavorful desert! If you have a blackberries patch, give it a try. I guarantee you'll like it. T-shirts drying on the line. We used this tutorial just in case you want to try one on your own. The individual t-shirts are shown below. No rules except the t-shirt had to have a ladybug on it since that was the theme of the Camp this year. It's the last day. We have had a blast. 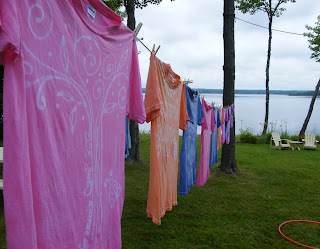 The kids will sew their Grammie Camp 2012 patches on their blankets this morning. Then it's time to go home this afternoon. We loved having quesadas for lunch today. It's a corn boil and wings for supper. It's Ladybugs at the Lake - Grammie Camp in two days. 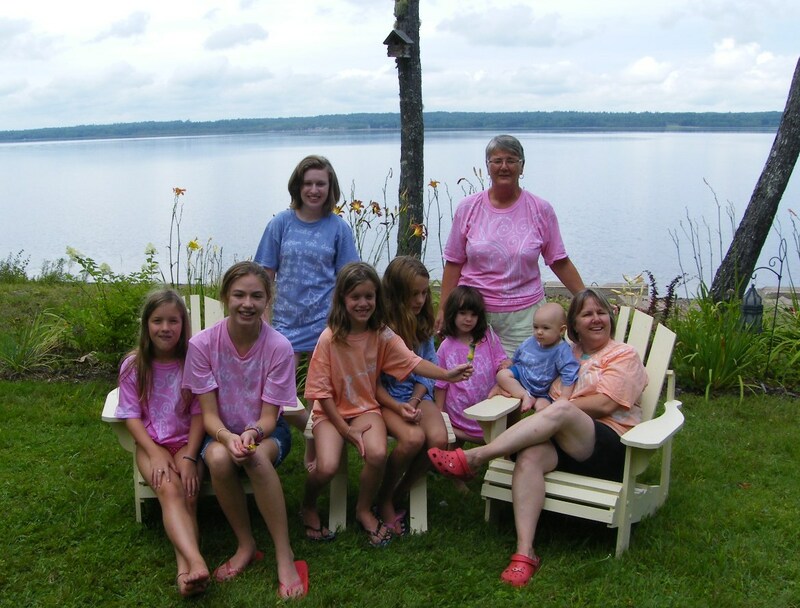 My sister and I will come from opposite directions, and will both arrive at the cottage Tuesday afternoon. We'll work for the afternoon on finalizing the activities and props. The kiddos will arrive in the evening. We'll be at the lake for 5 days and the weather ahead looks warm and sunny. That's great because thanks to Grampie and Scottie, we have a small air conditioner for the second floor of the cottage!! We're stoked. We shared the theme of this year's Grammie Camp with the kiddos last week. Watch for updates through out the week.